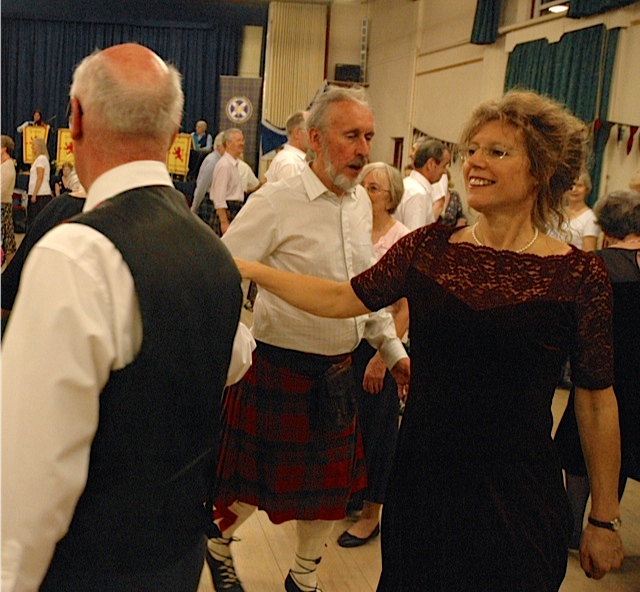 Orpington and District Caledonian Society is a friendly Scottish Dancing club where you will not only learn how to dance but also get fit, make new friends and most importantly have fun! We hold classes for beginners and improvers on Monday evenings. These take place at St Paul's Church Hall, Crofton Road, Orpington BR6 8JE from 8pm to 10.15pm. During the evening you will learn the steps, the moves and the dances from our qualified and friendly Scottish country dancing teachers. There are always experienced dancers on hand to help steer you in the right direction. Your first taster evening is free! Then it's only £5 per week for members (annual sub £5) and £5.50 for non-members. Interested? Please contact us via email (click on the logo at the bottom of the page) or just turn up on any Monday (excl Bank Holidays) and you can be assured of a warm welcome. Soft shoes for dancing in, enthusiasm and a sense of fun! All new dancers are welcome: on their own, with friends or as a couple. The Society has been promoting social contact and friendship between Scots and non-Scots since our foundation in 1937. Our main interest is Scottish Country Dancing but we are also interested in Scottish culture and traditions holding Burns Night and St Andrew's celebrations. We are run by a committee under the leadership of our President Hadyn Davies, Vice President Linda Scothern and Secretary Deirdre Wilden. Other committee members are Angela House (Past President), Di Lewis (Treasurer), Angela Campbell, Ginny Colenbrander, Joan Kinnear, Roger Randall and Claire Tanner. Please bring a plate of food to share, cutlery will be provided. Tea, coffee and squash will be available. There will be a raffle during the interval. To find out more about the Orpington & District Caledonian Society and their activities click on the image below and send an email or use the link on the KASS Contacts page.